This week, what does the Buzz talk about first? A new cool national ranking? A new Domino’s Pizza with rare in-store seating and even rarer sales by the slice? New Mud Season Milk? My driveway was atrocious this morning. Mud Season Milk for the win. 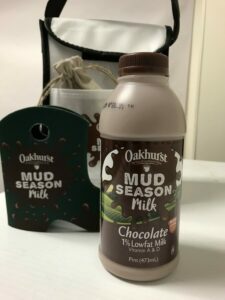 Oakhurst unveiled its temporarily renamed 1 percent chocolate milk on Wednesday. The look will hit store shelves this week and be available through the end of May, according to a spokeswoman. Around here, spring isn’t all green grass and bunny rabbits. It’s slushy. It’s muddy. And we love it! . . . The new Domino’s Pizza at the site of the former gas station at 1104 Lisbon St. is opening Thursday officially, with a soft opening planned for 4 p.m. Wednesday if you’re hungry sooner. This week Business.org ranked the best cities and towns for working women using measures like wages, unemployment rate, sexual harassment claims and bachelor’s degrees, and ranked the Lewiston-Auburn metropolitan area the third best in the country in the “towns” category. The Monmouth General Store, a Main Street fixture in that town, is listed for sale but not shutting its doors. “I grew up in Monmouth, I graduated from Monmouth, I wouldn’t do that to people,” said Martin Gawron, who owns it with his wife, Jessica. He estimated the general store has been open since the early 1900s. The couple bought the building 16 years ago and have run the store for 12 years.